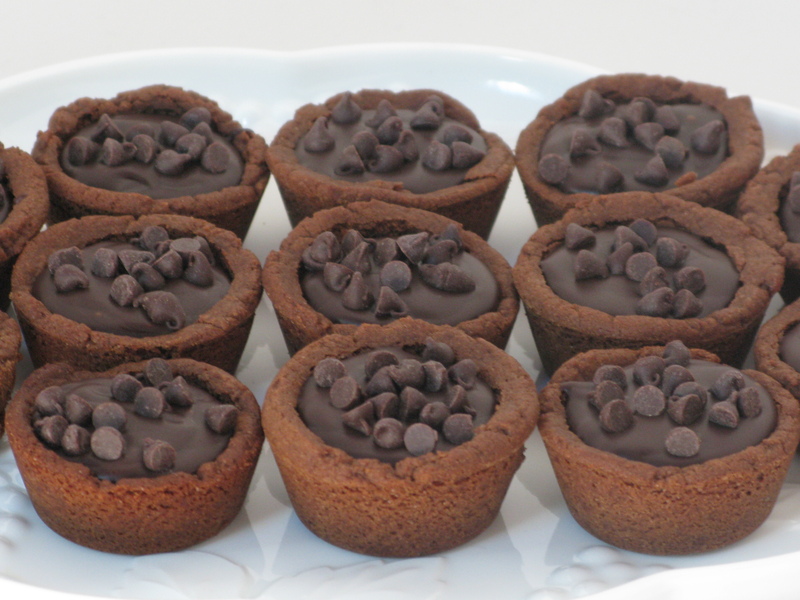 If you’re looking for a small chocolate dessert, look no further. This is a great combination of chocolate cookies and chocolate truffles, all rolled together in one delicious recipe. I came across a recipe in a holiday dessert catalog, but made a few minor changes to this particular recipe. During the baking process, my chocolate-loving husband must have asked me three or four times if they were done yet. I’m looking forward to trying these out on my other chocolate-loving family members. Preheat oven to 400 degrees. Cream butter and sugar together until fluffy, using electric mixer. Add egg and vanilla, continue mixing. Gradually add remaining dry ingredients until mixture is well combined. Grease a mini muffin pan, and scoop 1 tablespoon of dough into each cavity. Using a tart press, press the dough into the bottom and up the sides of each cavity. Bake for 8 minutes, remove from oven and press bottom of dough down again in each cavity. Carefully remove to cooling rack and cool completely. This batch makes about 2 1/2 dozen. Combine all ingredients in small saucepan, cook on low/medium heat. Stir occasionally until chocolate and butter are melted, and mixture is smooth. Transfer to a bowl to cool for about 20 minutes. Spoon about 1 tablespoon of mixture into each tart, sprinkle with mini chocolate chips or chocolate sprinkles as a garnish. Place in refrigerator for truffle filling to set. Store in airtight container.